Hi Everyone! Long time no tea! 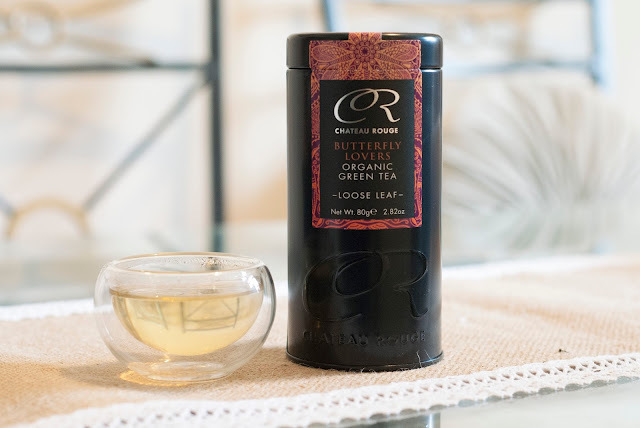 This is the second installment of my Chateau Rouge tea series and this time i've been brewing 'Butterfly Lovers Organic Green Tea'. 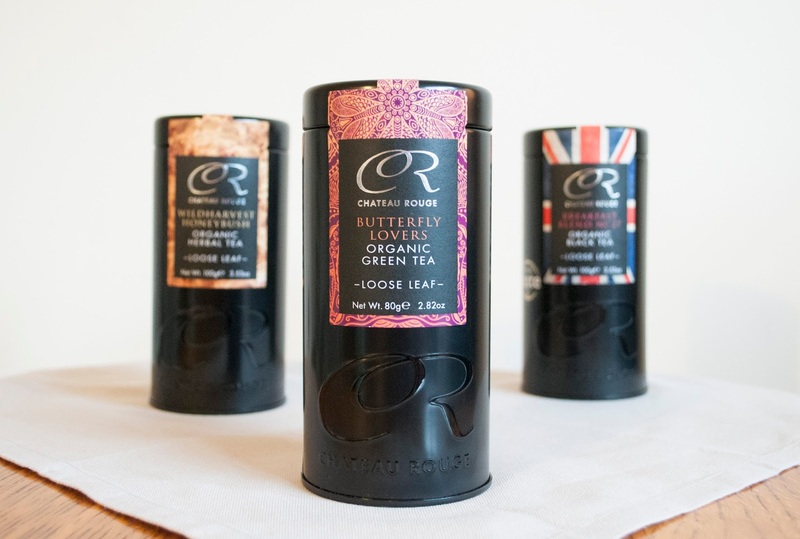 This is Chateau Rouge's signature house green tea blend, with leaves selected from China, Sri Lanka and Nepal and flavoured with Seville oranges and wildflowers. The pretty yellow wildflowers were a lovely surprise when I opened the tin (I tend to dive in first and read the info later!) and straight away I felt this green tea was different to others around, as the aroma coming off the leaves was extremely pleasant. It's obvious that this is a perfect choice for the Spring and Summer months with its grassy and citrusy notes. I brewed this for 3-4 minutes at quite a high temperature as instructed, and found it too weak when I tried to drink it before the time was up! I really enjoyed this organic green tea; it was perfectly rounded, with hints of peach and a refreshing tangy and zesty quality. Having the Seville orange flavour with the green tea reminded me of the pairing of bergamot with black tea to make Earl Grey. 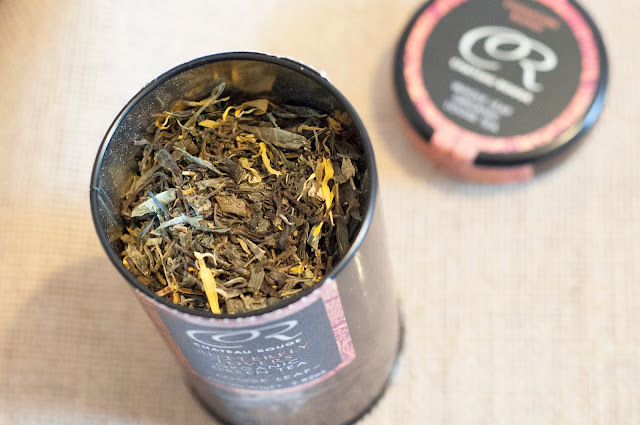 So if you like a proper Earl Grey and similar pairings, this could be worth adding to your tea cupboard (don't be embarrassed, we all have one). 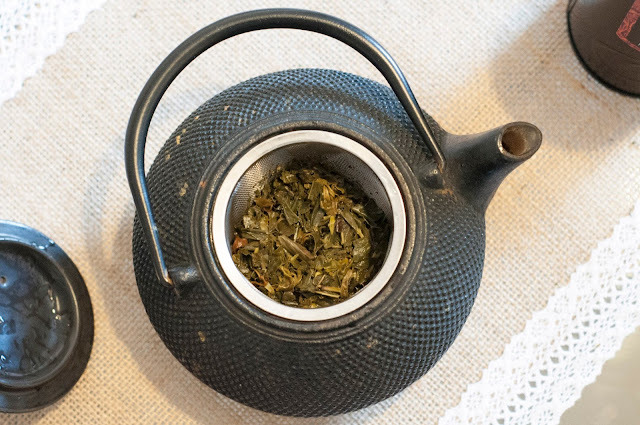 As with most quality loose teas, this refreshing green tea will make at least two cups with the same leaves. I found it had some similarities to black tea as there wasn't any of that bitter fishy taste you can sometimes get with green teas (especially if you over-brew) and therefore I really recommend it, even for people who usually prefer black tea. At the point of writing this blog post, this 100% Organic Green tea is priced on Chateau Rouge's website at £9.50 for 80g of loose tea in their signature black tin and if you can't get enough of it, the large refill pack is £32.95 for a whopping 400g.